1. 300 grams skimmed milk cottage cheese. 2. cut into 1/2-inch cubes. 3. 1/2 small fresh pineapple, cut into 1/2-inch cubes. 4. 1 large unpeeled cucumber, cut into 1-inch pieces. 5. 1 medium green capsicum, cut into 1-inch pieces. 6. 2 small head of iceberg lettuce. 7. 6-8 black olives, stoned and sliced. 8. 1 teaspoon garlic paste. 9. 1 tablespoon lemon juice. 10. 1 teaspoon red chilli powder. 11. 1/2 teaspoon mixed dried herbs. 12. Salt according to taste. 1. 1/2 tablespoons salad oil. 4. 1 teaspoon mustard powder. 5. 5-6 black peppercorns, crushed. 6. 1/2 teaspoon white pepper powder. 1. Combine the garlic paste, lemon juice, chilli powder, dried herbs and salt. Rub the mixture into the cottage cheese pieces and set aside to marinate, preferably in a refrigerator, for fifteen to twenty minutes. 2. Mix together all the ingredients for the dressing in a bowl. 3. Thread the cottage cheese cubes onto skewers. Heat the oil on a griddle and place the skewers on it. Cook, turning the skewers a few times, to brown the cottage cheese evenly on all sides. Remove the cottage cheese pieces off the skewers and transfer onto a plate and set aside to cool. 4. Combine the grilled cottage cheese, pineapple, cucumber, capsicum, roughly torn iceberg lettuce and olives in a large serving bowl. Drizzle the dressing over and toss to mix well. Serve immediately. Eating fruits and vegetables of different kinds have long been associated with a reduced risk of many health conditions. Many of the studies have been suggest that increasing use of foods like pineapples decreases the risk of obesity and overall mortality, diabetes, heart disease. Pineapples are also good for healthy complexion and hair, increased energy, overall lower weight. 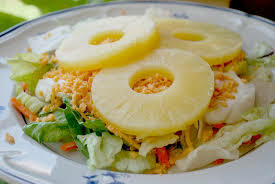 It is observed that pineapple is the main dietary source of bromelain. Bromelain is anti-inflammatory properties. It is useful for the treatment of sports injuries and the pain caused by them. According to different studies, it has been observed that bromelain has the potential to act as an effective cancer-fighting agent. It is an excellent source of the strong antioxidant vitamin C. And pineapples can help combat the formation of free radicals known to cause cancer. Pineapple is also very helpful for digestion.Pineapples, consist of fiber and water content, it help to prevent constipation and promote regularity and a healthy digestive tract. It is also good food for heart health.The amount of fiber, potassium and vitamin C content in pineapple all support heart health. According to one study who eats 4069 mg of potassium per day had a 49% lower risk of death from ischemic heart disease compared with those who consumed less potassium. It is also beneficial to reduce the chance of stroke and provide protection against loss of muscle mass.